At the February meeting we talked about starting some new free workshops for GMQ members and we have finalized the details on the first one! 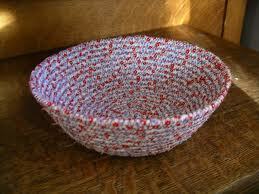 Sima has agreed to teach us how to make the stylish fabric bowls she showed us at the meeting! THANK YOU, SIMA! Here are the details…. please READ CAREFULLY and bring all the supplies listed. 1. Sewing machine that sews straight and zigzag stitches. 3. 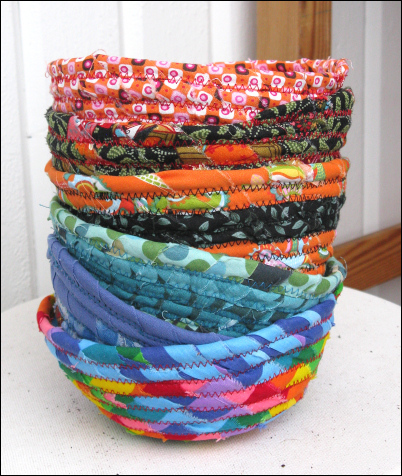 1/2 yard of fabric(s) cut into 1/2″ strips. If you want a really large bowl bring more fabric. 6. 1/2″ or 3/8″ wide cotton clothesline (found at Joann’s or Walmart). If you plan to attend please post a comment below to let us know so we have a head count. See you then! Cute! Spring break with the kids…. can't be there. I work 😦 neat project though. As long as my hubbie doesn't get called into work, I'll be there. Which size line is better??? I'd love to, but I was out of town all week and just have too much going on. Y'all have fun, and I'll see some of you Thursday for the Quilt Expo outing! Any size will do.. but the smaller the more cording you will n eed to make a decent sized bowl. Hi. These are amazing! I am in the UK. Any chance of some instructions please? Hello! 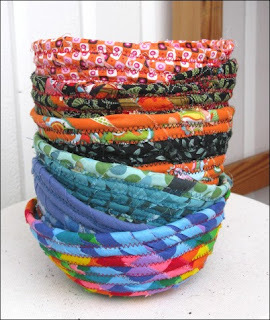 Is there a way to get a tutorial for the quilted baskets? I absolutely LOVE these bowls! They are beautiful! Since the date for the tutorial was almost 5 yrs ago and some of us didn't live in your state, not even our country, I saw one who posted from the UK. Could you possibly post or send us the instructions for making these lovely bowls? It would be so appreciated! Hi Paula! Here are two video tutorials where I teach you how to make them. Hope that helps!